The AV-8B Harrier jet is the plane that acts like a helicopter and can literally take off and land anywhere a helicopter can. With its ability to conduct Vertical/Short Takeoff and Landing (V/STOL), the AV-8B Harrier II jet provides the U.S. Marine Corps with the mobility and firepower needed during combat missions over harsh terrain. With the ability to take off and land with no airstrip, the Harrier provides the U.S. Marine Corps with flexibility on the battlefield that helicopters or other jets cannot match. The Harrier II is a subsonic attack aircraft that is used for combat. Because of its ability to conduct vertical takeoffs and landings on short runways, the AV-8B Harrier II is commonly called the "Harrier Jump Jet." The aircraft was designed by McDonnell Douglas, which is now part of the Boeing Company. The first Harrier jets were developed and entered service in the late 1960s. A modification of the Harrier jet entered service with the U.S. military in 1985, and variations of the aircraft have been in active duty since then. The Harrier II is used primarily for attack missions. The aircraft can be launched from small aircraft carriers and even smaller amphibious assault ships. The U.S. Marine Corps is the main operator of the Harrier II aircraft. However, other militaries also use variations of the jet, including the British, Spanish and Italian Navies. The Harrier II is capable of deploying a wide range of weapon systems. The weapons include The Advanced Medium range air to air missile (AMRAAM). The Sparrow missile and other air-to-surface AGM-65 Maverick missiles. Also the anti-ship Harpoon and Sea Eagle missiles. A 25mm cannon for close air support and the USMC Harriers are fitted with the 1,000lb Joint Direct Attack Munition (JDAM). The AIM-120A Advanced Medium-Range Air-to-Air Missile is an all-weather, fire-and-forget, air-to-air missile, equipped with an active radar seeker and a high-explosive warhead. The range is over 50 miles, and the speed of the missile is 1.2km a second. The AIM-7 Sparrow medium-range, air-to-air missile is held in the arms inventories of many countries, including the user countries of the Harrier II Plus aircraft. The Harrier II Plus is capable of deploying the Sea Eagle anti-ship missile, which is a fire-and-forget, sea-skimming missile also carried on the Sea Harrier, and the air-launch version of Harpoon AGM-84 surface strike missile. The Pegasus turbofan engine 11-61 (F402-RR-408) from Rolls-Royce provides a high thrust-to-weight ratio and retains its performance in hot and high-altitude conditions with an ability to climb 14,000 feet per minute. The significant aerodynamic features of the aircraft are large Leading-Edge Root Extensions (LERX) and under-fuselage Lift-Improvement Devices (LIDs) that are essentially small valved control jets in the nose, tail, and wings that give it control in low airspeeds. The jet is outfitted with landing gear on the fuselage and wings, drooping ailerons (the wing lift control surface that forms part of the trailing edge of the wing), and the slotted flaps augmented vectored engine thrust. In the Gulf War of 1990-91, during Operations Desert Shield and Desert Storm AV-8B Harriers totaled nearly 4,000 flights against Iraqi targets. In 1999, AV-8B's were in Yugoslavia during Operation Allied Force. In 2001, AV-8B's were involved in Operation Enduring Freedom in Afghanistan during the earliest operations against the Taliban after 9-11. 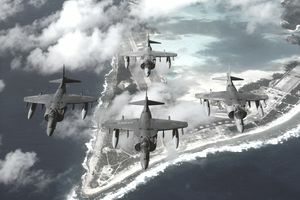 The aircraft participated in Operation Iraqi Freedom in 2003, acting primarily in support of USMC ground units. In 2011, USMC AV-8Bs were launched from USS Kearsarge in the Mediterranean Sea in support of Operation Odyssey Dawn, enforcing the UN no-fly zone over Libya. In addition to major conflicts, USMC AV-8Bs have been deployed in support of humanitarian operations throughout the continent of Africa throughout the 1990s. USMC AV-8Bs were deployed over Iraq against Islamic State (IS) forces. Surveillance operations continued after the start of Operation Inherent Resolve against IS militants. The AV-8B is to be replaced by the F-35B Lightning II.